The CeleBreak football community in Valencia is becoming increasingly popular. 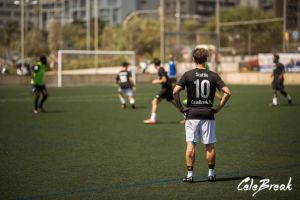 Based in Barcelona, CeleBreak organizes pickup games, and creates leagues and tournaments. More and more people (visiting or living in Spain) are getting involved in this CeleBreak family. Valencia is the new additional communities to the strong Barcelona one. We took some time to get to know the man in charge of CeleBreak in Valencia, and find out more about his organization. In Valencia, CeleBreak is making its mark. The heads of Celebreak there are Benjamin, and Antonio. We interviewed Benjamin, and learned about life in Valencia and CeleBreak there. Q: What is the CeleBreak community like in Valencia, and how has it been growing? Benjamin: We started the community in October of last year, and since then it is growing every week. The first weeks we organized 3 sessions a week, and now we already offer matches 5 days a week. Q: Are the players usually students, abroad visitors, or people working in Valencia? Benjamin: There is not really a typical CeleBreakVLC player. A lot of students play, as well as people who work here. We also sometimes have tourists play. Q: What is more popular in Valencia: pickup games, leagues, or tournaments? Benjamin: For the moment, we only have pick up sessions. We hope to start soon with tournaments and leagues. Q: Are you a football player yourself? What’s your favorite club team? Benjamin: Yes, I definitely am! My favorite team is Ajax, from Holland. In Spain, I support Real Madrid. Q: Why do you love Valencia? Benjamin: Valencia is a great city to live in. Valencia is quite big, so you will find everything you need very close. It’s not too big though. Q: What’s the best goal you’ve seen in a CeleBreak pickup match? Benjamin: It was an in the air… back heel volley goal, straight from a throw in… amazing. Q: Are there games for women? Benjamin: Not especially for women, but some women attend to most of the games. Q: What are some of the fields you guys play at? What’s your favorite field? Benjamin: I really like to play at the field of Turia Tramo III, because it looks like a small stadium! Q: Are there people that always play? Benjamin: We have a lot of people who have their favorite days to play. These people almost play every game on that particular day. Q: Any crazy moments during a CeleBreak match? Benjamin: Not really during the matches, but yes, a lot of crazy moments after the matches when we drink a beer (or more) in the bar. Q: What’s life like in Valencia? Benjamin: It’s very exciting, way better than it is in the Netherlands. Valencia really has a good vibe. The Ruzafa neighborhood is very vibrant and has a lot of bars. The City of Art and Sciences is a project everyone should see! Q: What is your top restaurant recommendation? Benjamin: I recommend everyone at a lovely and authentic Paella at the restaurant: La Pepica, located at the boulevard. 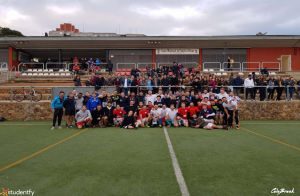 If you’re trying to find a place to play some football in Valencia, CeleBreak is definitely the organization for you. Communities lead by people who love football, and dedicated to making your football experience a great one. If you want to look more into CeleBreak, or sign up for a league, tournament, or pickup game use the link: celebreak.eu.